When new clients first interact with your law firm, it's usually in one of two ways: through your website or over the phone. When a client calls your firm, you want the person answering the phone to convey a professional image. That's where professional phone etiquette comes into play. Professionalism doesn’t have to mean stuffiness or rigidness. Professionalism is simply conducting oneself or an organization in such a manner that conveys competency and respect. There are a few things you can do to help you get there. Using professional naming conventions and formalities, for example, can help you convey professionalism. Until clients ask you to address them on a first name basis, use formalities such as "Mr. Smith" or "Ms. Johnston" and do the same when referring to law firm members. Once the conversation starts, it's up to whoever is manning your phones to keep the call professional. Speaking in a pleasant tone can also convey professionalism. If the person answering your phone seems miserable, rushed, and unhappy, it doesn’t exactly create a good image of your firm. Nobody likes speaking to people who seem unpleasant. Even longtime clients deserve professional phone etiquette. From their first call to their 40th call, make sure they hear a professional greeting every time they call. Conversations may inevitably become a bit more familiar, but try to keep them as professional as possible. To avoid dropping the etiquette when you're after hours, you have several options. One option is to have a special cell phone that you use only for business calls. Another option is to simply refuse to take business calls after hours, potentially losing your next big case. Perhaps the best option is to leave your phones to a professional, trained answering service. Alert Communications' phone answering staff is trained extensively in a range of phone etiquette rules and scenarios. They work with you to develop greetings and scripts that their virtual receptionists use when answering your phones. 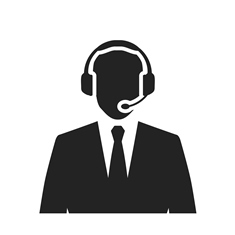 When you have their staff answering your phones you can rest easy knowing a professional, courteous voice is always available to answer your phone, 24 hours a day, 7 days a week, every day of the year. Browse their website to learn about their full range of phone support services. When you're ready to learn more, or to jump right in, give Alert Communications a call at 800-801-7628.